Mode of occurrence: Irregular blocks and nodules of varying sizes. Cortex: Worn, thin (max. 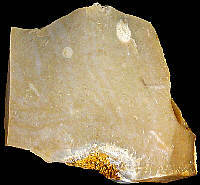 1 mm), smooth or pitted with partially rolled patches (material reworked during the Cenozoic), brownish yellow, transition sharp. Colour: Light brownish grey (10YR 6.5/2), light yellowish brown to light olive brown (10YR 6/2.5 to 10YR 5/4), brown (7.5YR 5/2). Pattern: Basically featureless, rare pale spots (unreplaced matrix), random specks (skeletal grains). Appearance: On the whole the material is homogeneous, although some samples show micro-vugs and diaclases; other properties such as lustre (medium to dull), translucency, feel and grain (fine to medium) are highly variable. 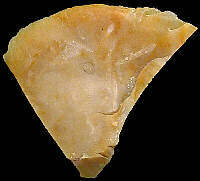 Texture: Generally wackestone, one sample mudstone. Grains: Generally 20 to 25 %, one sample 5 to 7.5 %; pale, rounded, irregular and highly fragmented (80 to 250 µ), seldom whole with low sphericity (max. 8 mm). Grain composition: Colonial bryozoans (a majority of bifoliate Cheilostoma, some Cyclostoma), rare thin-walled triaxon sponge spicules, very rare foraminifera; traces of iron oxydes in the samples affected by epigenesis. Co-ordinate precision: The coordinates given were taken from a large-scale map, and are within 50 metres of the actual spot. The latitude/longitude coordinates are a direct transformation of these data on WGS84 and are accurate to the same level, so don't be deceived by the apparently high precision to the single second. 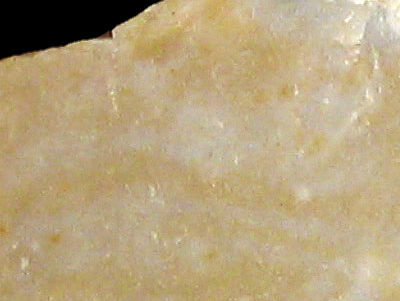 Geology: According to the geological map, the substrate dates to the Oligocene (unit g), but the flint itselfs comes originally from Late Cretaceous (Senonian) strata. 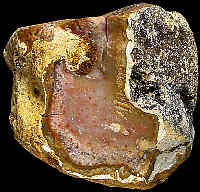 Other types of flint: Apart from the CC2-type of flint, also reworked Early Cretaceous (Valanginian) flint of the Val-type can be found here.